The Hercules Rubber & Tire company was founded in the 1950s and is a small but growing brand (the parent company is Cooper Tires, the fourth largest tire manufacturer in the U.S.). They operate not only in the U.S. but also Canada and internationally. The company also manufactures several other brands such as Merit, Ironman, and Electra. For a touring tire, Hercules provides an unheard of warranty - 85,000 miles on the new Roadtour 855 SPE! Most touring tires have warranties in the 50-75k mile range. We tested the Hercules Raptis VR1 performance tire (205/55R16 stock size) on a 2002 Subaru WRX wagon for approximately 11,000 miles. They were reasonably quiet and did not squeal during spirited handling. Rain performance was decent, though that was expected as the tread depth was still good. If your tires are showing the tread wear bars or are getting close, they are not going to perform well in the rain, regardless of how good your tire was when new! 8.2 out of 10 based on 1 manufacturer rating as of 9/28/16. 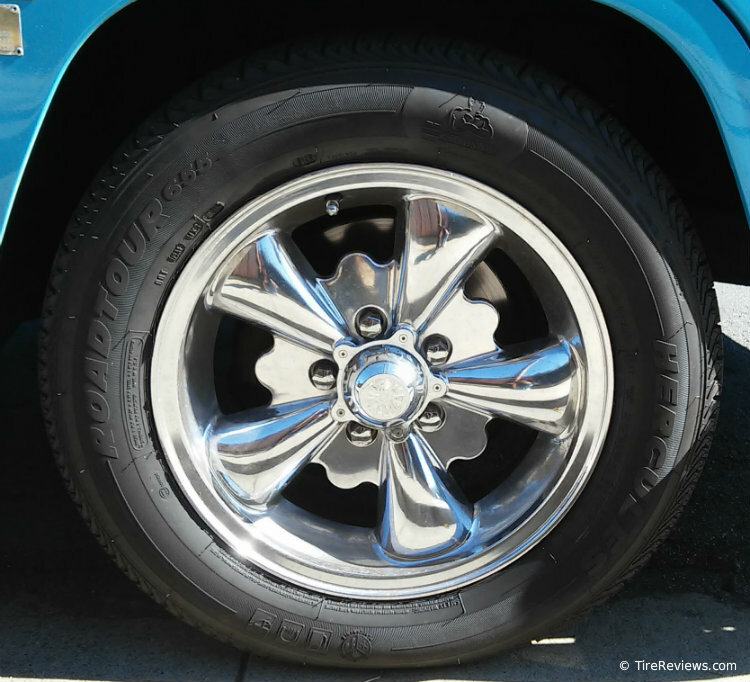 We haven't found many reviews on the Hercules Avalanche X-Treme tires. These are made for maximum traction on snow and ice, and are studdable. Hercules doesn't provide a mileage warranty on these, but cover them for 5 years (60 months) for defects. 8.5 out of 10 based on 1 manufacturer rating as of 9/28/16. Hercules bills this as a versatile winter tire that can handle not only snow, but cold rain, ice and slush as well. It is also a low rolling resistance (LRR) tire. We have come across some references that these are manufactured in Russia by Nokian - indeed, the tread pattern looks like that of the highly regarded Nokian Hakkapeliitta R tires! N/A out of 5 based on 0 user ratings as of 9/8/2016. This is Hercules' new long-lasting Touring tire. There are no reviews we are aware of yet, so we would compare this to the Kumho Solus KR21, which also boasts an 85k mile warranty and a 4.6 rating at TireBuyer.com. 4.5 out of 5 based on 2 user ratings as of 9/8/2016. The Roadtour 655 offers a 50-60k mile warranty, and is priced higher than we would expect given that Hercules is not a household name. There are not many reviews available, so we would recommend comparing against the multiple reviews for the Kumho Solus TA71, TA11 and Sense KR26, or our favorite, the General Altimax RT43, which is priced similar to the Roadtour 655 and is well reviewed by Tire Rack and everyday drivers for overall performance including for winter use. From reading the DOT tire code on the Roadtour 655's sidewall, we have determined that the tire is manufactured by Linglong Tire in China. The Roadtour 655 MRE is an improvement on the original Roadtour 655 (above). Hercules states that the improvements are for increased traction as well as tread life, which shows in the 55-65k mile warranty. We have not been able to locate any reviews yet, as the 655 MRE is new for 2016. 5.0 out of 5 based on 1 user ratings as of 9/8/2016. The Roadtour XUV is specifically made for Cross-over Utility Vehicles (think CR-V, RAV4, Ford Escape, etc.) with an emphasis on low rolling resistance for better fuel economy. It features a 50-60k mile warranty depending on speed rating, with sizes between 16-19 inches. 4.0 out of 5 based on 2 user ratings as of 9/8/2016. Hercules designed this tire more for inclement weather conditions, though it is not a true snow tire. The Tour 4.0 Plus has an in-depth review from a driver who tested the tires in both rain and snow. They performed well up to around 30k miles, when they were no longer recommended for use in the wet. Read at the link below for more details. 4.0 out of 5 based on 1 user ratings as of 9/11/2016. This is Hercules' new UHP tire, with an unusually high UTQG treadwear rating of 500, and a 45k mile warranty. It is actually made by Nexen Tire in South Korea. We have not been able to find many reviews on this tire as of yet, so if you are looking for a well reviewed UHP A/S tire, we would recommend the BFGoodrich g-Force COMP-2 A/S as the best, or the Kumho Ecsta 4X II as the best-bang-for-the-buck tire. 3.0 out of 5 based on 1 user ratings as of 9/11/2016. 4.5 out of 5 based on 15 user ratings as of 9/8/2016. This is a specialty tire made for trailer use. There is a 36-month warranty against defects, but no specific mileage warranty. The reviews are quite good, with a handful of sizes ranging from 13-16 inches. 2.95 out of 5 based on 35 user ratings as of 9/16/2016. Reviewers either loved or hated the original Terra Trac AT at Offroaders.com. No matter, as Hercules has come out with the Terra Trac AT II - see review below. Fourwheeler Magazine tested the Terra Trac AT II and were impressed at their rain and snow performance. It features more sipes and tread grooves than the original Terra Trac AT. Hercules provides a 60k mile warranty.